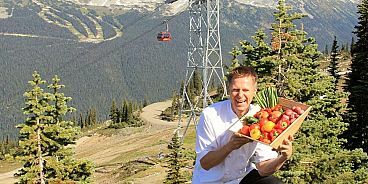 A big first to report out of Whistler…our world-class mountain is one of the first North American ski resorts to open a vegetarian restaurant on its hills. Raven’s Nest, located at the top of the Creekside Gondola, recently transformed into a veggie eatery with vegan options at the hands of Whistler Blackcomb’s plant-eating Executive Chef Wolfgang Sterr and Kristine Leise. The Raven’s Nest menu will feature a hot chickpea and vegetable stew, roasted vegetable chipotle chili, five different soups, four sandwiches made with Gardein plant-based meat, vegan mac and cheese, a few salads and even gluten free bread. In an effort to satisfy starving carnivores, a small selection of meat options will be available for those who ask, but you won’t see it on the main menu.